The North Carolina Wildlife Resources Commission has selected 2 of my paintings to be included in next year's Wildlife Calendar. This marks the third year in a row that my work has been included in this fine calendar. The pieces selected were "LOOKING BACK" and "The WALLFLOWERS". The 2015 North Carolina Wildlife Calendar features a variety of excellent wildlife art with profile. If you are interested in getting a copy of the calendar, go to the N.C. Wild Store to order yours. It was an honor to be selected to lead an acylic workshop for Crooked Creek Art League. Thirteen very talented artists joined me for a full 2 days of painting this past Friday and Saturday in Chapin, SC. Our subjects were a Carolina Wren and a Boykin Spaniel puppy. Thank you everyone for a fun couple of days! � at Crooked Creek Park. "2014 North Carolina Wildlife Calendar"
The North Carolina Wildlife Resources Commission has selected 3 of my paintings to be included in next year's Wildlife Calendar. The pieces selected were "Brittany", "The Apprentice", and "American Wigeon". 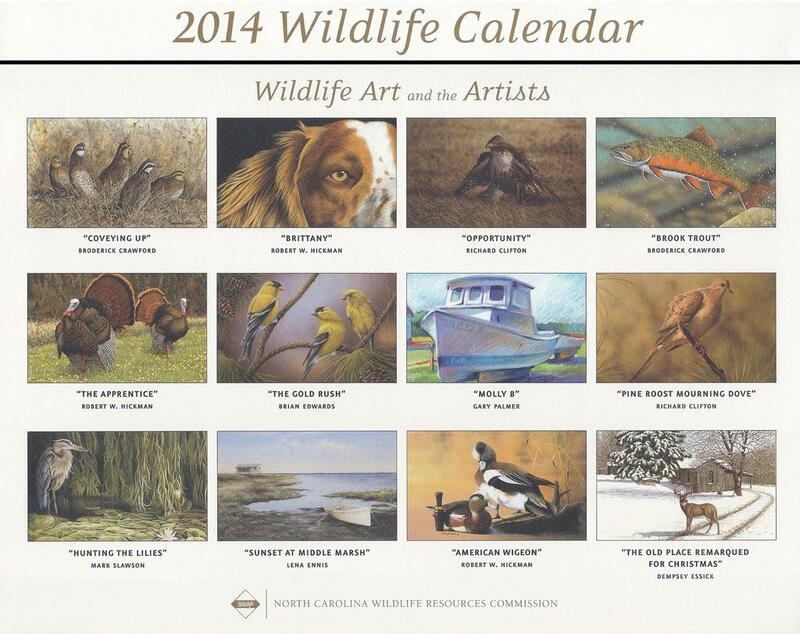 The 2014 North Carolina Wildlife Calendar features outstanding wildlife art with profiles of each artist, fishing days and moon phase information, a detailed almanac and a variety of other information. 10-1/4" x 14". These calendars sold out last year, so if you are interested in getting a copy of the calendar, go to the N.C. Wild Store and order yours soon! Local artists who were juried into ArtFields are invited to submit 2 works for the show....their ArtFields piece and 1 other. My 2 pieces are "Looking Back", and "Brittany". The exhibition will be located in the Gallery 80808 (808 Lady Street, Columbia, SC 29201) Gallery hours are 11 am to 5pm, Monday-Saturday; 1pm to 4pm, Sunday. This article in Lake Murray Magazine covers L.L. Bean's selection of my turkey painting, Last Dance, for their 2013 Spring Hunting catalog. I would like to invite everyone to the Arts Center in Greenwood, SC for several functions. They are having a wild game dinner on Sat. March 16th, as well as the ART of the HUNT art exhibit that starts this Monday, Mar. 11 and runs through April 5th. There will be work from several artists and carvers. They will have 16 of my original paintings on exhibit. They have a beautiful facility in the heart of Greenwood....hope you can make it! The 2013 L.L. 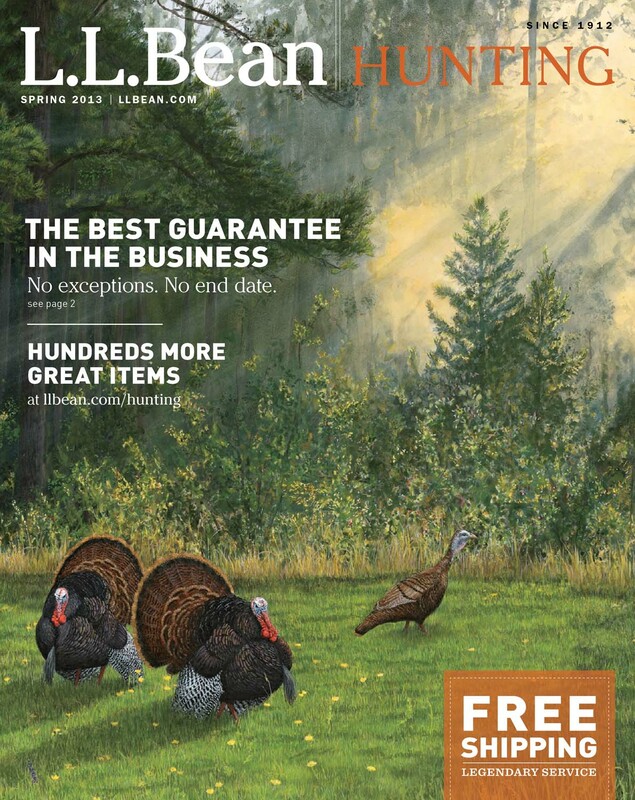 Bean Spring Hunting catalog is being delivered to over 800,000 homes across the U.S. this week. I am really honored, thrilled, and thankful to have my painting, "LAST DANCE", on the cover! Click Here if you are interested in purchasing this print. This is my latest painting that I have completed. It is acrylic, 32"W x 16"H. Please click on the photo to view a slideshow of the painting in progress. I recently completed my new Home Studio and Gallery. I currently have a large selection of framed and unframed art, as well as unique fine art lampshades. Currently gallery hours are by appontment only. If you would like the schedule an appointment, Please give me a call at P: (803) 730-4906 or e-mail me at rwh@rwhickman.com. Please click on the photo to view more images from my gallery.